This is an early stand-alone from John D. MacDonald, a writer best known for his series featuring Travis McGee. MacDonald was a prolific writer, but he was also very widely read and often incorporated social and economic themes into his books as he does here. The book, which was first published in 1953, is set in a declining industrial city somewhere in the Midwest. At the center of the story is the family that runs the Varaki Quality Market. The patriarch, Gus Varaki, once ruled the family and the business with a strong but benevolent hand, bringing into the business and the family outsiders who had fallen on hard times and who needed a helping hand. In particular, Gus has a close relationship with Paul Darmond, the local parole officer, and Gus has offered jobs and a home to two parolees that Darmond has recommended. But the family has fallen on hard times, emotionally if not financially. Gus's wife dies and that places a huge emotional strain on him. He later marries again, this time to a much younger woman, and his spirits are briefly revived. But then his middle child, Henry, is killed in the Korean war, and the loss saps Gus of his energy and attention. In consequence, both the family and the business begin to drift. Gus's other son, Walter, is deeply dissatisfied with his wife and with his life in general and takes advantage of his father's distraction. Gus's only other child, a daughter named Teena, falls in with the wrong crowd and soon has serious problems of her own. Now joining the family is another troubled young woman named Bonnie, whom Henry had married in California before leaving for Korea. Bonnie sees how things are dissolving around the family, but the question is can she do anything to stem the tide of trouble. More important, does she even care enough to want to? MacDonald teases out of all of these relationships a compelling story that touches on themes that were particularly relevant in the early 1950s, like juvenile delinquency, drug abuse, social and economic decay, and the place of family in the larger society. The criminal activities that occur in the book are of somewhat lesser importance than these larger issues, and at the heart of the novel is its central question: Are some people simply born bad and beyond redemption, or can people who might once have made a mistake truly change, reform their lives and become productive members of society? 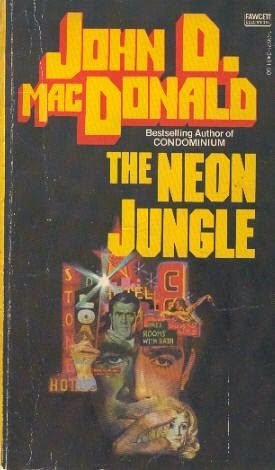 The Neon Jungle is a fascinating and entertaining read and it is one of a number of MacDonald's novels that have now been republished in great new trade paperback editions by Random House. This is very welcome news for long-time fans of MacDonald's who will now be able to fill out their collections, and it's also an opportunity for people unacquainted with MacDonald's work to be introduced to one of the masters of crime fiction in the second half of the Twentieth century.